A new survey by the Pew Hispanic Center, a project of the Pew Research Center, shows that Hispanic registered voters currently support Democratic candidates by a three-to-one margin in the upcoming midterm elections (65% vs. 22%). The survey data show, however, that there is a sharp divide between Hispanics who identify their religion as Catholic and those who identify as Protestant. 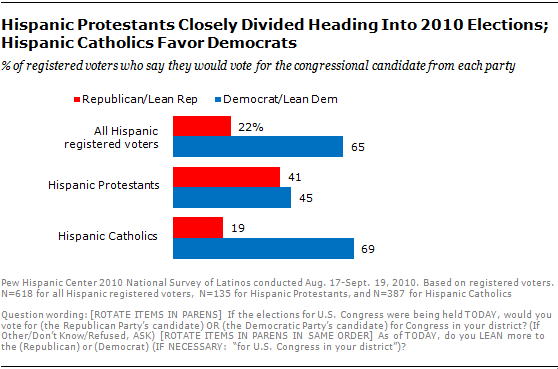 Hispanic Catholics overwhelmingly support Democrats over Republicans in the upcoming elections (69% vs. 19%), but Hispanic Protestants are closely divided in their vote choice (45% say they will support Democrats and 41% say Republicans). Hispanic Protestants make up about one-fifth of Hispanic registered voters (22% in the new survey), while roughly two-thirds of Hispanic registered voters are Catholic (64%). For more on Latinos and the 2010 elections, see the Pew Hispanic Center’s report.